Both the maximum and minimum temperature at Fort Collins, Colorado obliterated the previous record for the date. 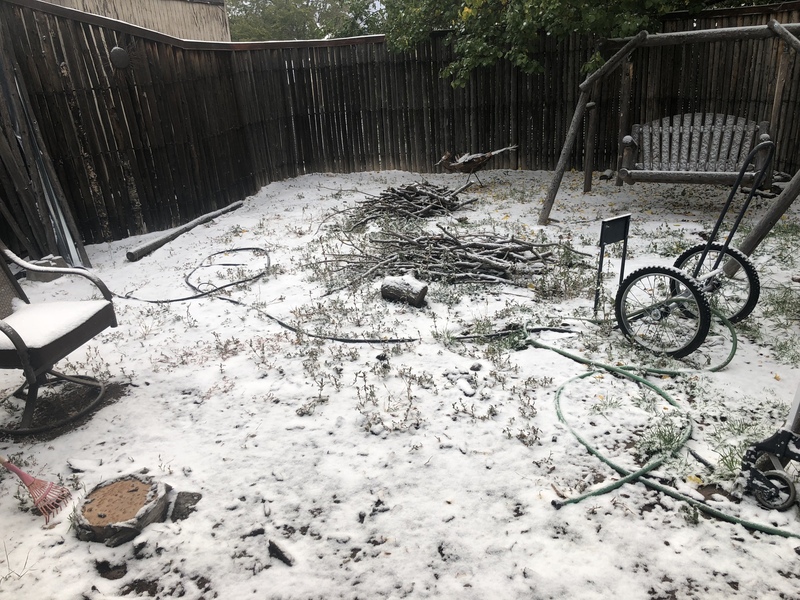 Yesterday was the first October 14 in Fort Collins which didn’t get above freezing. Average temperature for the date is 65 degrees. 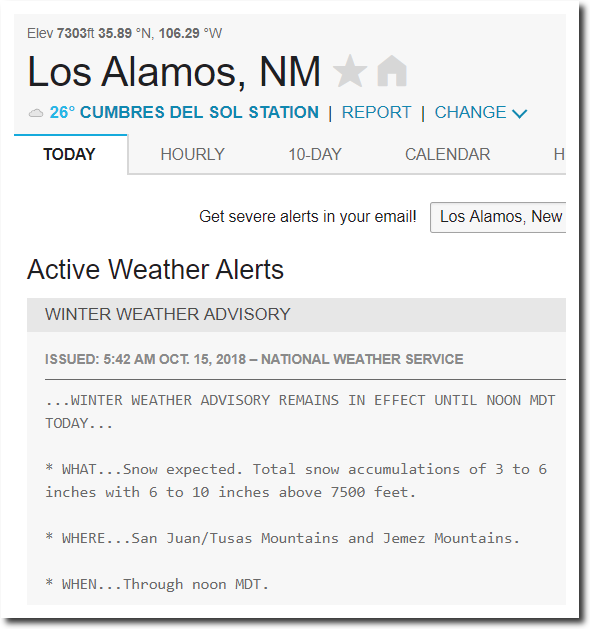 Los Alamos, New Mexico is expecting six inches of snow. I grew up there and can’t ever remember it snowing before Halloween. 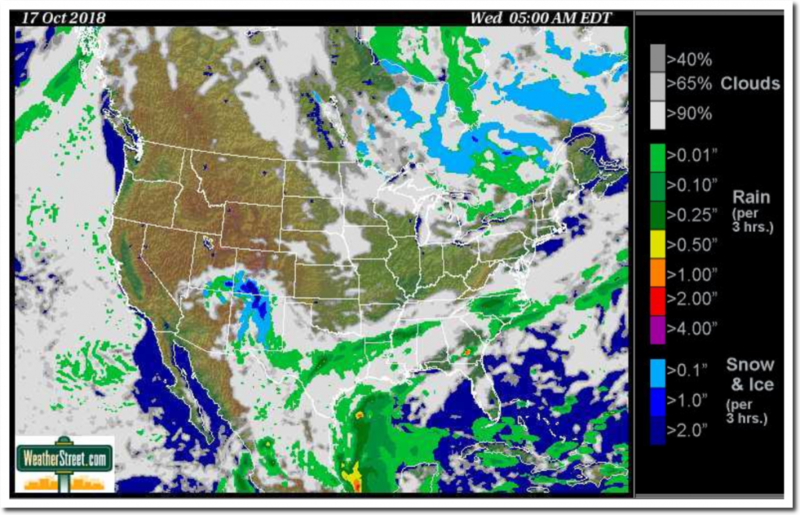 Heavy snow is forecast for New Mexico and Texas, in Mid-October. This is an historic event. “They” Headlined about how hot the summer was. Your charts and some weather reports show the recent early cold. There is another unaltered record. Surface temps on the Great Lakes. Right now, Superior is at 45.4 F and at this date in 2017 it was 50.8 and in 2016 it was 49.7. For Lake Michigan the numbers are 43.8, 57.6 and 57. When I checked it in early September the differences were on the order of 9 degrees for Superior. Did not write it down. And there seems to be no archive. When winter arrives, these two will begin to freeze earlier than usual. The whole volume temperature is more relevant to freezing since the lake has to “turn over” before that happens, but those are also below recent years. I concur that freezing is likely to come quicker this year, especially with a cold start. Hudson Bay is also well below normal. I did the math recently on the amount of energy lost in Lake Superior with the 1 degree drop in whole volume temperature. It came out to 2.5 years worth of residential energy usages for the entire U.S. It is mind boggling how much energy is stored (or not) in large bodies of water (and ice sheets). 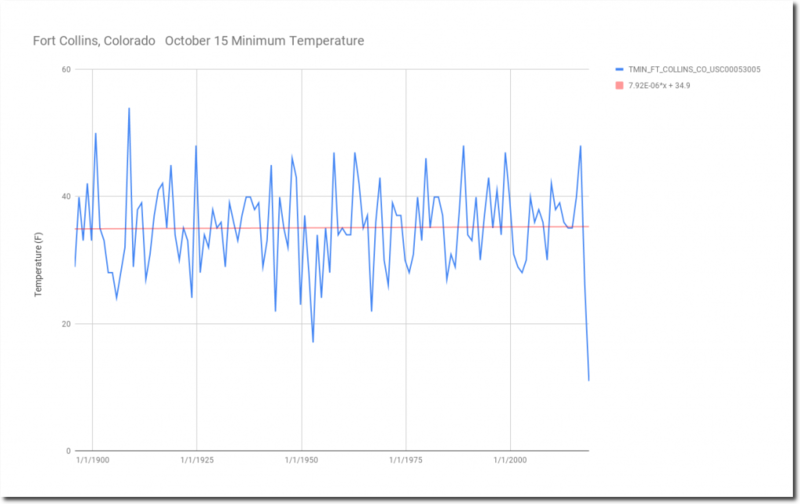 Air temps just aren’t as relevant as alarmists want us to believe. I just came across your blog. I’m trying to learn more about climate change, and want to look at both sides of the climate debate. How would respond to claims that we’re getting 2+ records highs for every record low? Sites like climate signals claim this has been the case for several years. Has the co2 in the atmosphere actually increased as much as claimed, or is the data misleading? The number of both record highs and record lows have both dropped sharply, and ratios of small numbers are meaningless. The only metric which seems to be getting warmer in many areas of the US are the night time lows. Water vapor. I did that in 2016. Went from 20 years teaching CAGW at the University to dropping out of the whole thing entirely. I just took everything at face value, but when I took a weekend to rebuild the CO2 -> CAGW linkage (essentially to dismiss the skeptics), I could not do it — and literally became irate about the science I was seeing. I hope your journey is not as painful as mine was. Good Luck! Thanks! I’m an evidence driven person. The main problem with this issue, is that has become almost entirely ideological. 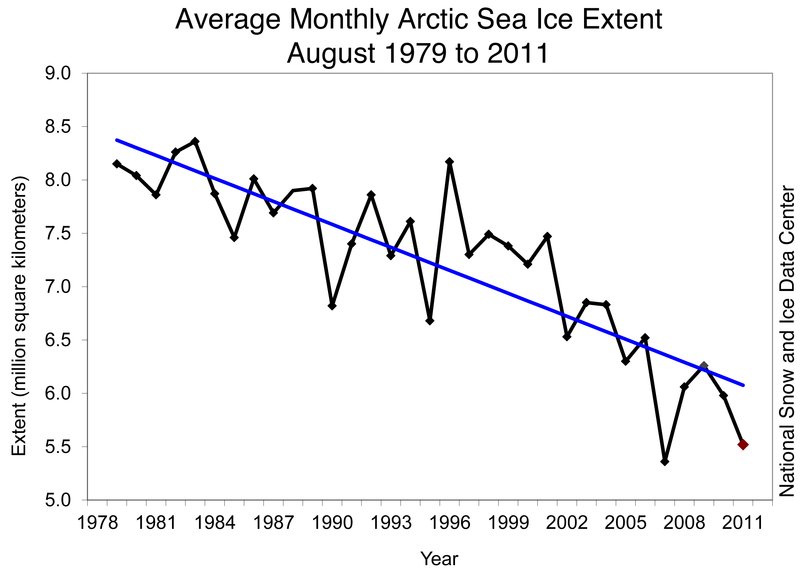 The graph I had always seen was the one below, showing Arctic Sea Ice Decline and it appears in a number of textbooks on CAGW (quite famous actually). It is pretty straight forward and I never gave it much thought: obviously we have a huge problem. And then I saw Tony’s video – and I was not happy. The other video that captured my attention was of the Sierra Club President testifying in front of the Senate about Climate Change. So Alan Dershowitz says Cruz was the brightest student that he ever had in class. I have great respect for a person with a degree from one of those universities, but to be at the top of the class is a level beyond. So I thought: What is a guy like Ted Cruz doing supporting a bunch of tinfoil hat wearing, lunatic, climate change deniers? It just did not add up. Either Cruz was wrong, or I was wrong. And as my degree is not from Harvard, I felt obligated to really dig deeply to see what the hell was going on. The UN IPCC is the leader in the charge in the claim of human caused catastrophic climate change It should never be forgotten that the UN is a political body. Every sentence of a report from the IPCC is parsed and edited as needed by political operatives before it is published. How would respond to claims that we’re getting 2+ records highs for every record low? If it were true, UHI would easily explain it. The answer is.. NO, There is NO evidence. The badly named GHE (greenhouse effect) from CO2 has never been observed or measured on this planet of anywhere else. It exists ONLY in models. Another fact is that the planet is really only a small dump out of the coldest period in 10,000 years. Yeah, I’ve not seen convincing evidence that CO2 is responsible for warming. I also wonder if the effects of increased CO2 has been blown way out of proportion. Same with me. On top of it, I started wondering lately if the impending Y2K disaster may also have been blown way out of proportion in the late 90s. I reckon I’ll give it a few more years before I’m ready to go on record. Y2K alarmists will claim that there was no disaster because “necessary action was taken”. When no climate disaster eventuates, I would not be surprised at all if the same line is used. Sadly, that kind of idiocy has no cure. ps.. be VERY THANKFUL for the slight warming since the cold anomaly of the Little Ice Age. Be VERY THANKFUL that atmospheric CO2 is rising, enhancing the biosphere, and helping to increase crop yields around the world. The increase in atmospheric CO2 is a win, win, win situation for all life on Earth, totally beneficial, with absolutely zero evidence of any downside. That’s actually a great point. It would seem that there should be NO new record lows. Kansas City just recorded its earliest snowfall on record Sunday evening…0.2″. No doubt this will be conveniently ignored just like the 2nd coldest April was this past spring (a subfreezing high temperature as late as April 15). Our all-time record low of -23 was recorded in December 1989 and I’m sure this reading will be deleted from the temperature record as soon as anyone old enough to remember it dies off. Adjusted not deleted. 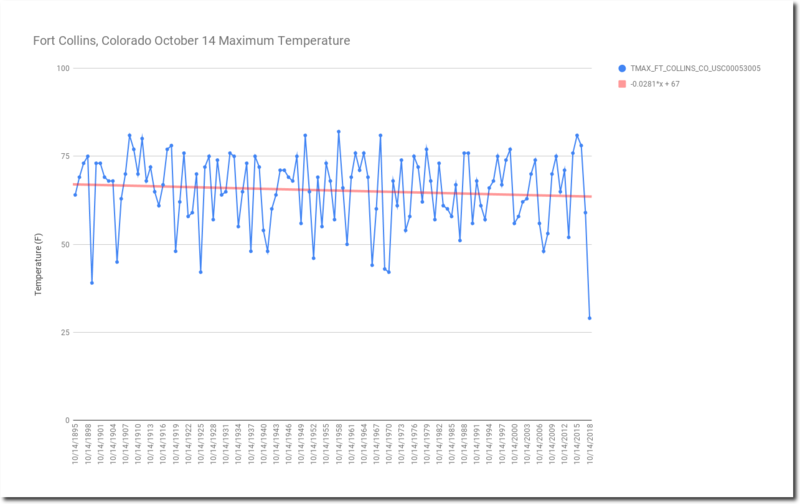 The deep state still needs the old data to notice how much warming bias such as how placing near car park will raise temps compared to old data where the sites were on grass. Fraud is evident. But these leftists can claim their data show we are deny everything. If no old data they wont be able parrot the 1 celsius temp rise bs. They have no data, only the output of models. White Rock/Los Alamos this morning…. Wichita and Dodge City also has measurable snow on 10/14. Wichita’s earliest previous measurable snow was on 10, with records going back to the 1800’s. So a very freakish event! Earliest previous snow at Wichita was on 10/22. Sorry about the typo. See proof of AGW. Now give me more money so I can live in my eco green home in Tennessee to show that an eco green environment is achievable. Today, Oct 15, the DFW record low temp for this day-of-the-year is 42F. Right now, 10:42 am, its 41F. Looks like a new record low, breaking the one from 1914. Oh, and so-far today, 3″ more permanent drought in my rain gauge. 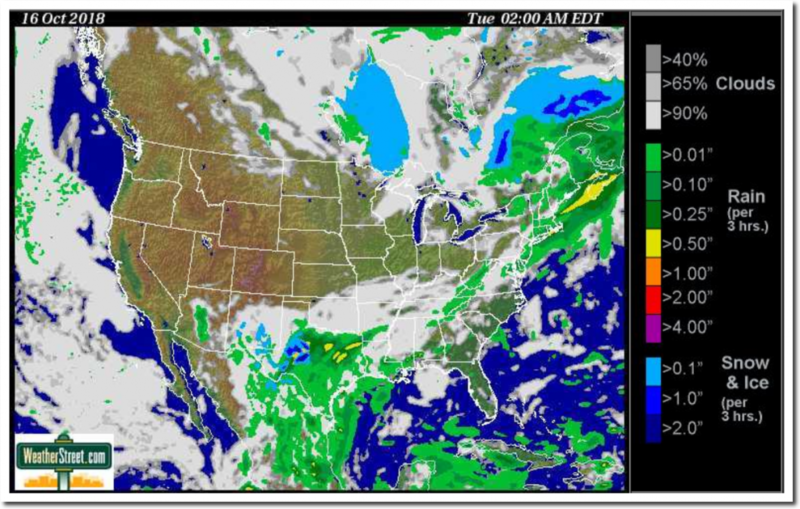 And, the permanent drought for today has increased to 3.5″. Also: New record for 1st day not reaching 50F, and coldest october day in 25 years. You all realize of course that the only reason there is record cold is the Al Gore effect. He opens his mouth, and cooling happens. Is it just an AlGoreRythym??? Or perhaps Gaia has a sense of humor? Or as my childhood pastor would sometimes say “God is not mocked”.